Graco has been producing quality pump and spray equipment since 1926, always pursuing better solutions and quality innovations in spray foam technology. Therefore, it comes as no surprise that this industry leader offers some of the best spray foam machines in the world. At Intech, we carry a select stock of Graco spray foam machines that can accommodate a wide spectrum of projects. We have selected a few standouts from our inventory to help you decide which one would be a good pick for your business. Why we chose it: Compared to the standard Reactor 2 E-30, this electric model allows the user more control over their projects. It’s equipped with superior information logging, is easier to care for, and performs exceedingly well. This model is a sleek, modern upgrade on the traditional electric machine, offering users easy maintenance and a space-saving compact design. The very definition of efficiency and dependability, this model can update your spray foam capabilities to 2018’s standards. Why we chose it: This air-driven model can apply up to 25 pounds of spray foam insulation per minute. A reliable companion for even the toughest projects, the Graco A-25 Reactor gives you a lot of value for your investment. Has DataTrak, a battery-operated control system that keeps the job going regardless of worksite conditions. Is user-friendly with easy-to-understand digital controls. We recommend this machine for small-scale work that requires portability, speed, and versatility. For contractors who are mainly doing residential or smaller commercial projects, this machine is the right pick. 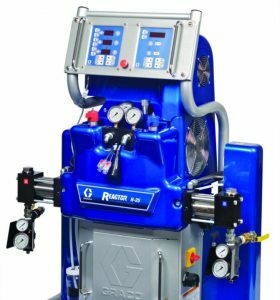 If you need help finding the right Graco sprayfoam parts that complete this machine, get in touch with our customer support. Why we chose it: When you upgrade to the H-40 Reactor 2 Elite, your productivity skyrockets. Enjoy the reduced downtime and high yields without sacrificing any quality in the work you do. The Graco H-40 Reactor 2 Elite is a dependable, highly productive machine that doesn’t require constant maintenance to function. Graco’s hydraulic machines are excellent for high output spraying, making them a great fit for high volume jobs that need increased yields. This model is also integrated with the Graco InSite remote reporting technology that allows users to track the progress of the job from any preferred mobile device. This user-friendly machine also can store up to 24 spray foam recipes and is easy to troubleshoot with its QR code shortcuts. To find more about this model and why it’s one of the best in the industry, speak with our friendly sales staff. Why we love it: Massive turnover, high volume jobs, an excellent investment. This is the apex of proportioners, meant for the highest volume jobs you can muster. It’s essentially a “one man army” for any of your high-volume sprayfoam needs. We saved the best for last- the Graco Reactor 2 30i Elite that comes with all the bells and whistles. This model is the pinnacle of the Reactor 2 line and is an all-inclusive machine. It has everything the other models boast while being the standout “turnkey” model that is ready to use as a single unit. The heat and compressor systems are already installed in this machine, so once it arrives on the site, you’re ready to work. It’s also hardy against harmful power surges but still maintains consistency in spray foam application even when there are fluctuations of power in the field. At Intech, we’re dedicated to providing you the best sprayfoam machines and related supplies. We stand by the Graco brand because of its proven durability, dependability, and quality. To learn more about our top picks for Graco Spray Foam Machines, contact us.